Nicknamed the “Lake Township of Oakland County,” West Bloomfield, Michigan is resplendent with untamed natural beauty. Yet it has all the modern conveniences of a well-planned residential community. In fact, in 2012, Money magazine named West Bloomfield one of the top 100 small communities in the United States. People have long appreciated West Bloomfield for the gorgeous scenery it offers. The town started as an immigrant farming community in the early 19th century. However, by the late 1800s, West Bloomfield had become a summer haven for wealthy families in Pontiac and Detroit. Over time, West Bloomfield evolved into a primarily residential area. In the 1960s, the permanent population grew rapidly, as more people seeking suburban living moved out farther from Detroit. West Bloomfield residents are privileged to live in a picturesque community with access to superb recreational facilities and unspoiled countryside. The Drake Sports Park offers West Bloomfield families a place to stay fit as they engage in a little friendly athletic competition. If you’re in the mood for nature and contemplation, the Marshbank Park on Hiller Road has a scenic walk and a fishing dock on Cass Lake. For those who enjoy recreational pursuits in a posh atmosphere, country clubs such as Pine Lake, Tam-O-Shanter, and Bay Point abound. In addition to their township’s luxurious amenities and spectacular terrain, residents appreciate the area’s robust business community. 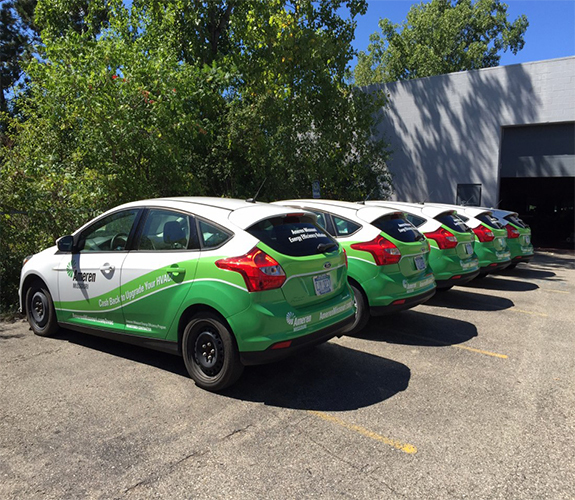 Just twenty minutes south of West Bloomfield in Farmington Hills, Perfect Impressions Graphic Solutions makes marketing more appealing with its custom, expertly applied vehicle wraps. We can use any high-quality image you provide to make a car wrap for your business or other interest. Vehicle wraps can be applied to cars, trucks, and even buses, covering areas that paint traditionally does not—such as windows, bumpers, spoilers, or even the side-view mirror exterior. Durable yet flexible, vinyl car wraps can be used to quickly change the entire look of a vehicle. If the details you wish to display on your company car or truck are subject to frequent alterations, perhaps to reflect a business’s seasonal offerings, wraps certainly have an advantage over paint. For example, you might run a lawn care company that focuses heavily on mowing during the summer, switches to leaf blowing and mulching in the autumn, offers snow and ice removal in the winter, and aeration and planting services in the spring. Wraps allow you to advertise each set of services during the seasons when your potential customers would need them. When you choose Perfect Impressions Graphic Solutions, you can be assured of a professional vehicle wrap application. Car wraps are applied in Perfect Impressions’ specially heated garage facility, so that they adhere perfectly to your vehicle—no matter what the weather outside. Don’t hesitate to take advantage of vehicle wraps to improve your business’s exposure in West Bloomfield. Call Perfect Impressions at 800.974.4699 today for a free quote—and learn how our custom car wraps can transform your business’s advertising.